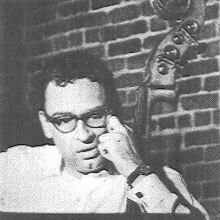 Louis Gottlieb, bassist and lofty comic spokesman for The Limeliters, is highly symbolic of the so-called "new comedy" (Mort Sahl, ,Nichols and May, Lenny Bruce, etc.) a new generation of unabashed intellectuals who not only refuse to talk down to an audience, but also wouldn't know how.Lou's special trademark on stage is a delightful burlesquing of the University pedant, the sort of teacher who is knocking himself out over the jokes in Chaucer while his restless and puzzled class has nothing on its collective mind that happened earlier than last night's date. "Many of the things I have been enthusiastic about," agrees Lou, "mean absolutely nothing to most people." The "enthusiasms" of Lou Gottlieb are indeed manifold and include every conceivable aspect and bypath of two distinct fields - music and comedy. An original member of the Gateway singers, as well as arranger for the Kingston Trio, Lou left this group at the peak of its popularity to return to academic life. In 1958 he became Dr. Louis Gottlieb with a Ph.D. in Musicology. His dissertation was an edition of 21 hitherto unpublished cyclic masses of the 15th century. "Fascinating," says Lou, "but hardly the stuff to support Dolly (Mrs. Gottlieb) and the two children." He returned to show business as a single comic because "I'm a performer and if I go three weeks without performing, I get sick." Vaguely dissatisfied as a single, Lou realized he needed a string bass as an on stage prop and the right group to sing with. When he met Alex Hassilev and Glenn Yarbrough for the first time in May 1959, Lou immediately knew this was it. An editor and contributer to "Jazz-a Quarterly of American Music," his knowledge of music is all-embracing and encyclopedic. To illuminate a learned article on the Late Lester Young, he musically notated about twenty different recorded solos by the great tenor saxist, commenting in typical Gottlieb "on stage" fashion: "I will never forget the first time I heard Example 5 in a record store in Washington, D. C."
The other consuming passion in the world of Dr. Gottlieb is show business in all its divergent aspects, with particular emphasis on comics and Audience Reactions, which he finds endlessly fascinating. He is a voracious reader of great novels and political and economic theory, while the realm of Bach and Schonberg is as familiar to him as the decor of the hungry i. Far from idle or disembodied pedantry, Lou's intellectual accomplishments have an exciting vitality; this is evident not only in the on stage performance of The Limeliters, but also in the off stage conversations of Dr. Gottlieb which have an intoxicating effect on all within hearing range. "Education," wrote Lou recently in his syndicated column for college newspapers, "is the greatest entertainment - even though, God knows, all education is not entertaining." While acclaim and fortune is fine for a performer, it may taint the reputation of a scholar. Some of Lou's academic associates tell him, "Lou , you are 37. For God's sake get into a real line of work." Lou will reply, as always, that he is a performer. More than that, he likes to sing.